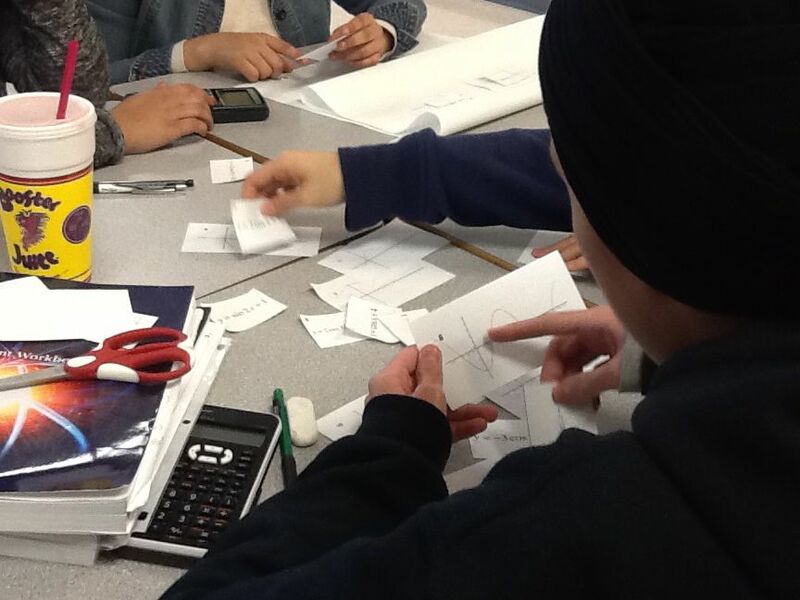 On Monday, I was invited to Sandra Crawford’s Pre-Calculus 12 classes to try out an activity we created together. Thanks, Sandra! 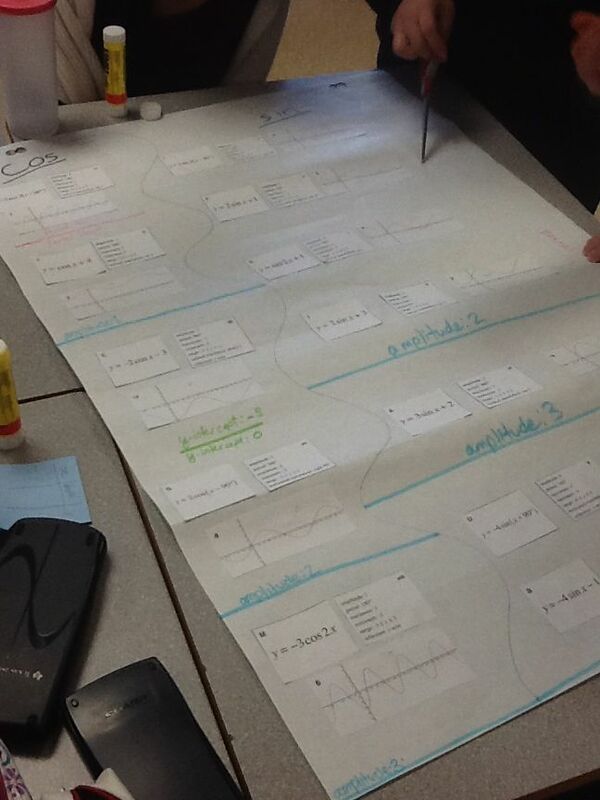 Sandra’s students were familiar with how transformations of functions affect graphs and their related equations. They’ve stretched & shrunk (vertically & horizontally), flipped (in the x-axis & in the y-axis), & slid (up, down, left, & right) linear (& piecewise linear), quadratic, absolute value, reciprocal, & radical functions. These were topics in prior units. In this unit, students were previously introduced to radian measure, the unit circle, the six trig ratios, & the functions y = sin x, y = cos x, & y = tan x. Next up: determining how varying the values of a, b, c, & d affect the graphs of y = a sin b(x – c) + d & y = a cos b(x – c) + d.
Such was the case when I last taught trig functions (in Principles of Math 12). Back then, my approach was to provide clear and concise explanations, connecting these transformations to those transformations (or, better, transformations of these to transformations of those). But was this necessary? Shouldn’t students be able to make this connection? On. Their. Own. 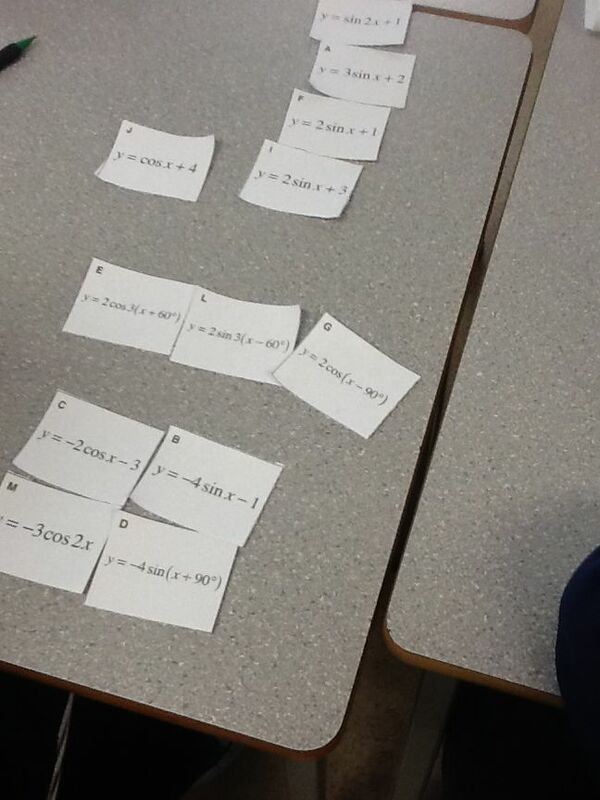 In small groups, students were handed a set of equation cards to sort and were asked to explain their sorting rule. We designed the equations so that there were plenty of similarities and differences in terms of whether or not there were leading coefficients, coefficients of x, brackets, etc., as well as in terms of the values of a, b, c, & d themselves. After all that, most groups just sorted the equations into sine and cosine functions — to be expected, I guess, given the focus of the prior lesson. Next, students were handed graph cards and were asked to match each to the corresponding equation card. We encouraged students to make predictions, then test these predictions using technology. Interestingly, few reached for their graphing calculators or phones. We asked students if, having seen the equations and their graphs together, they wanted to re-sort. This process was repeated with characteristic cards. Note: The terms amplitude and period were introduced the lesson before; phase shift and vertical displacement were not. Hence, horizontal translational and vertical translation at this stage of the lesson. 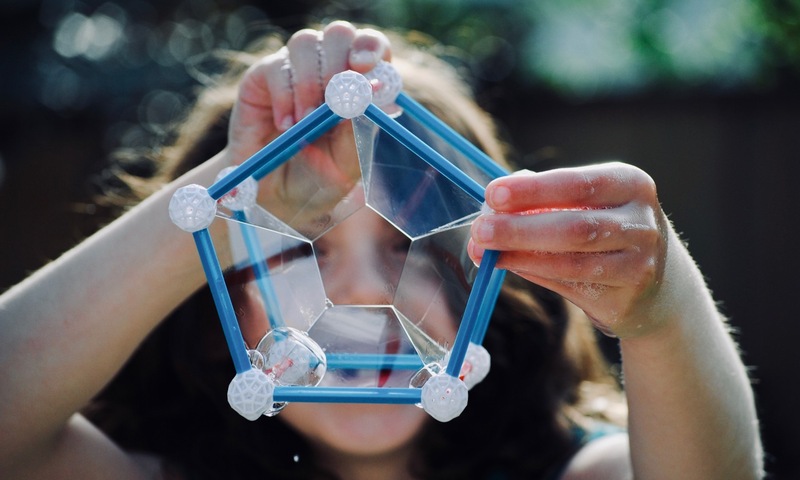 For the most part, students were communicating and reasoning mathematically, making connections, and problem solving. They were engaged with mathematics. A minority probably would have preferred to be engaged with taking notes. Groups shared their sorts the following day. In the end, the functions were sorted in a variety of ways, which allowed Sandra to highlight each transformation. A few groups struggled with matching all of the cards. Therefore, I reduced the number of functions. If finished, some students could be given two additional functions. Each of these is actually a phase shift of one of the initial eight (e.g., y = cos x + 2 ↔ y = sin (x + 90°) + 2). I wonder what they’d do with that.